Urban Ladder vs Pepperfry: Who'll win the online furniture market? The devil is in the details. Back in July 2012, when Bangalore-based Urban Ladder launched its website, it was loaded with different features that helped buyers know the finest details of every piece of furniture. One of the features that caught everyone's attention was products being displayed along with a human silhouette. The purpose of this feature was to give buyers a fair idea of the height and width of furniture when compared with an average person's height. The feature became an instant hit, and within a few months, its competitors copied the idea. It has become industry standard now to display silhouettes with products. "It took us one month to get the artwork right. Some websites which blindly followed us ended up making ghosts," laughs Ashish Goel, CEO and co-founder, Urban Ladder. Goel's jeers underline the cut-throat competition in the online furniture market where every small move by one player is forcing others to follow suit. 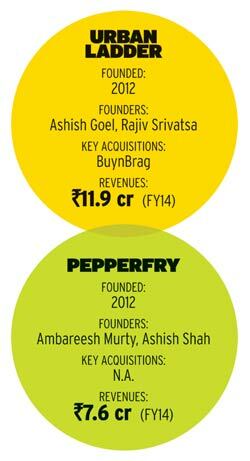 The online furniture market got off the ground in January 2012 with the launch of Pepperfry. About two months later, FabFurnish started and later, Urban Ladder joined the fray. 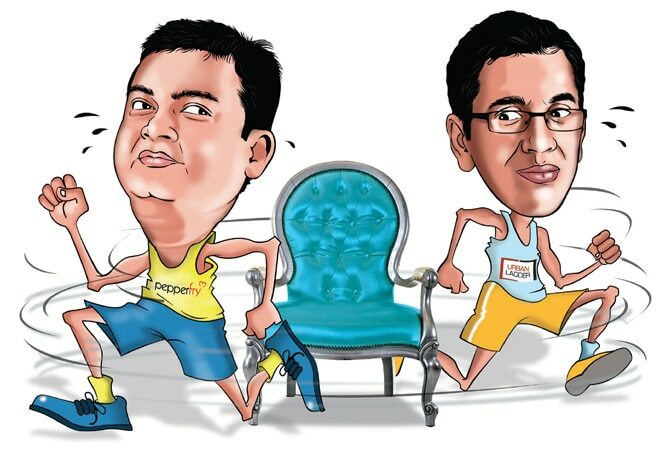 Over the past three years, Pepperfry and Urban Ladder have clearly emerged as frontrunners in the race of seven players. Pepperfry has taken a clear lead in terms of setting up its own logistics network and product catalogue. Urban Ladder, though, has more funding and has clocked revenues that are almost twice of Pepperfry's revenues last year. Pepperfry delivers to 150 cities (using own vehicles) across the country, which is the highest reach in this segment. In comparison, Urban Ladder is present in about a dozen cities. FabFurnish's specialised logistics service FabOne, which the company launched in March, is available in seven cities, although the company is using third-party logistics firms to cover more than 100 cities. Pepperfry's founder Ashish Shah says he wants to increase his reach to 400 cities. "I am single-mindedly focused on building distribution for large furniture items. Competition is not a worry for us. People are talking about logistics in 15-18 locations. I am far ahead in the race," he says. The company is looking at raising $60-80 million to strengthen its logistics network. Logistics is crucial in online furniture commerce. Relying on third-party logistics firm does not work in the long term because no logistics firm specialises in moving large items. Packers and movers companies are good with movement of products but are weak with technology. Breakages are one of the biggest problems with transporting large items. Take the case of a large storage unit, the product tends to be fragile as it is made from wood and glass. At different stages - from factory to warehouse to buyer's house - the companies have to do quality checks. Then, there is installation. Some apartments don't have big elevators that can accommodate three-seater sofas. This problem is non-existent in other categories. Similarly, strong focus on product catalogue has pushed Pepperfry ahead of the pack. It has close to 80,000 items spread across furniture, furnishings, kitchen, appliances and lighting. In contrast, Urban Ladder has close to 4,000 items. "I have wardrobes starting from Rs 3,999 to Rs 1.5 lakh. I can cater to both a BPO employee and Shah Rukh Khan. Anyone who is between 25 and 45 years of age and is in the home-making stage would buy," he says. Pepperfry's inventory is huge due to the non-furniture items that it sells (some 70,000 SKUs) whereas Urban Ladder has only recently launched non-furniture categories such as carpets and lighting. Urban Ladder boasts the highest funding among its peers. It has got some $78 million, and a personal investment from Ratan Tata, Chairman Emeritus of Tata Sons. In fact, the investment by Tata is seen as the biggest breakthrough for the company. "It's recognition of what we are doing," says Goel. In comparison, FabFurnish has been going slow with just about $30 million of funding available, a tad better than Pepperfry's $28 million. Furniture is a long tail business. For instance, buying a mobile is different from a sofa. Before making a purchase, the consumer is more or less sure about the phone model (Apple iPhone or Samsung Galaxy S6) to buy. Since furniture products are not standard, a consumer wants to see various choices before buying. "That's because the buyers are not sure about the design they want to buy," says Pepperfry's Shah. He cites an example: "In a building, if there are 50 flats, each home would most likely have a different bed but some would have similar phones. If you want to win the home space, you need variety and reach. I have both." Both Urban Ladder and Pepperfry get a significant part of their business from the furniture segment. Urban Ladder claims to sell items with much higher average ticket size than others. For example, its ticket size is Rs 20,000 as compared to Pepperfry's Rs 14,000. "Globally, if you look at Wayfair, a $2.5 billion company in the US, 70-75 per cent of their business comes from smaller products. Same is the case with the US-based One Kings Lane," says Goel. To offer variety, both players have controlled the sourcing of furniture. Pepperfry works with small artisans and handicraft makers in Rajasthan, and helps them in negotiating price to procure raw materials. Besides Rajasthan, the e-tailer is evaluating the Northeast (for sourcing Rattan and cane furniture), and Pondicherry and Kerala (for rosewood furniture). Pepperfry's furniture business has two parts - own labels and branded business. It works with some 80 brands such as Godrej Interio, Durian, HomeTown and HomeStop. Profit margins are better in private labels. "A lot of my products would be similar to offline stores such as FabIndia or HomeTown. However, I will be at least 25-30 per cent lower priced," says Shah. The exponential growth of the online furniture segment has attracted a lot of investments. Vertical players also expect horizontal e-commerce companies to pose threat to their growth. Snapdeal is the only horizontal player selling furniture. Flipkart is reportedly planning to enter the segment. As a result, they are building strong defensibility in the form of a supply chain network. "The real competition will come from Amazon or Flipkart because they are much bigger in terms of traffic and capital availability," says Goel. The focus is also to keep shipping costs under control. Pepperfry's average logistics cost per item used to be Rs 3,000, which has gone down to Rs 450 now. "Shipping out wardrobe from Delhi to Mumbai with, let's say Gati or Blue Dart, would cost Rs 6,000. My distribution network is designed in a way that it costs me much less," says Shah. Nikhil Prasad Ojha, partner at Bain & Company, says two factors that give vertical players an edge over horizontal shopping sites are unique logistics requirement and high customer purchase engagement. "We estimate that the total online furniture sales will be around $1 billion in 2018, a rapid growth from $120-150 million last year," says Ojha. A large part of the overall $20-billion furniture and furnishings market in India is unorganised. Furniture e-tailers know people still have inhibitions about buying large-ticket items such as furniture online. Both companies are leaving no stone unturned in this battle. A sample: A few days before Tata invested in Urban Ladder, Goel had visited his Mumbai office for a meeting. While waiting in the office, a sofa set caught his attention. He instantly clicked a photo in his phone. When inquiring about sofa, Goel was told that Tata had designed it, and that many years ago, Tata had worked with famous American designers Ray and Charles Eames when he had developed interest in designing. Urban Ladder will be launching the same sofa in next two months. Rival Pepperfry's Shah says the marquee investment by Tata in Urban Ladder is actually an endorsement of the online furniture category rather than just the company. "We are hyper-competitive but when you are ahead, you don't have time to worry about those lagging behind," says Shah. In the e-commerce industry where pecking orders keep changing, his smugness will not cause much of a concern for archrival Goel. Zomato or Foodpanda: Who will win the online food delivery space?